Ildiko Szekely (BUMS) was the top female in the Misery Challenge. 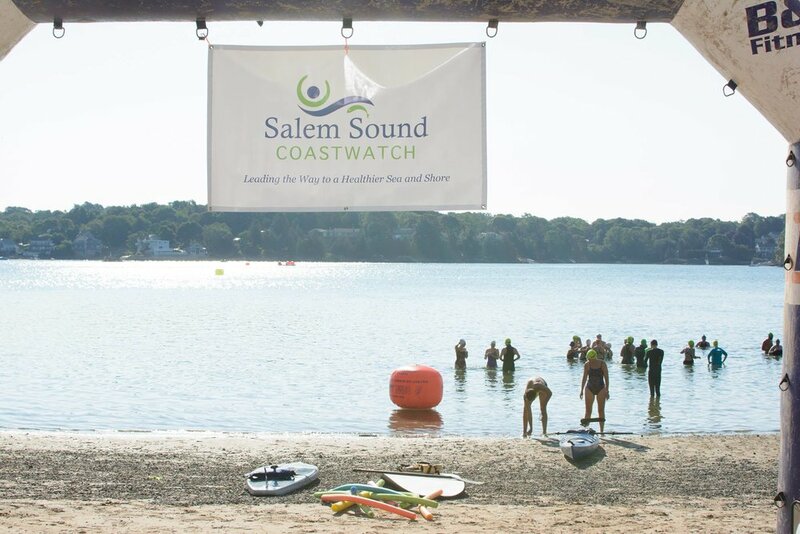 MANCHESTER-BY-THE-SEA, MA -- Over 100 hardy competitors, including many NE-LMSC members, completed this year's Misery Challenge swim on July 15. Misery Challenge is a 3-mile out-and-back swim between the Manchester-by-the-Sea yacht club and Misery Island. The sky was overcast and the water was cooler than in previous years, but the sea conditions were very calm, making for fast swimming. As with last year's race, swimmers had to navigate low tide conditions, completing the course with a 200-yard beach run. This year's winners were Eric Nilsson (57:11) of Tech Masters (MIT) and Ildiko Szekely (1:00:15) of Boston University Masters (BUMS). Another notable performance was Sam Levinson's (Unattached) completion of the course swimming butterfly in 1:48:48. Levinson is training to take on the channel swims of the Triple Crown of Open Water Swimming -- butterfly! Many thanks to race organizer Josh Crosby and his team, volunteers, and sponsors for another terrific event. Mindy Williams (GSP) was third overall female and won her age group. Martha Wood (Unattached) and Guy Davis (GBM) each won their age group. On September 26, Trent Theroux swam 40 miles around Aquidneck Island, home to Newport, Rhode Island, to raise money for RISE Above Paralysis - a non-profit focused on assisting families of people who have experienced spinal injuries. Trent faced six-foot swells and headwinds during his roughly 18-hour swim, but he powered through and came ashore with a smile. Check out a video of Trent's finish at Bowen's Wharf here. Follow more of Trent's swim via the real time updates posted to NE-LMSC and SwimRI's Facebook pages. Congratulations Trent!! Congratulations to all who participated in the Boston Sharkfest earlier this month. Nearly 500 swimmers covered the one-mile distance across Boston Harbor from east Boston into the Seaport on calm waters under sunny skies. Members of the NE-LMSC made a great showing, taking age group honors in almost every age group in both the wet suit and non-wet suit categories. A special shout out to CMSC member Franny Cohen who celebrated her 60th birthday by swimming Sharkfest - her first open water race! - and taking silver in her age group. Helen Lin continues to prove she has no limit when it comes to navigating the open water. Earlier this month, Helen became the first person to make the 18-mile round trip swim from Nantasket Beach in Hull to Northeastern University's Marine Center in Nahant. Helen took a whopping 10-minute break in Nahant before heading back to Nantasket. Read the Patriot Ledger's coverage of Helen's swim (along with video) here and enjoy the video from her crew here. Legendary open water swimmer - 53-year-old Penny Palfrey of Seventeen-Seventy, Queensland, Australia - handily won the 8-mile Boston Light Swim across Boston Harbor on August 15th with a time of 2:56:48. Palfrey maintained an amazing 85 strokes-per-minute pace throughout the eight-mile course. Finishing second overall, and winning the men's competition, was 63-year-old James Clifford of Poolesville, MD, the oldest male competitor in the race. Clifford finished in 3:08:22, edging out third place finisher Jennifer Olsen, 44, of Natick, MA, who finished in 3:11:28. The Boston Light Swim is the oldest open water marathon swim in the U.S. and has been a local tradition since 1907. Participants begin in the water at America's first lighthouse, the Boston Light on Little Brewster Island in the outer Harbor. The course continues past George's Island and Rainsford Island, then along Long Island (and past where the Long Island Bridge used to stand), and around Thompson's Island. Swimmers come ashore at the historic L Street Bathhouse in South Boston, home of the world famous L Street Brownies and the L Street Ice Swimmers.